John William Waterhouse RA (6 April 1849 – 10 February 1917) was an English painter known for working first in the Academic style and for then embracing the Pre-Raphaelite Brotherhood's style and subject matter. His artworks were known for their depictions of women from both ancient Greek mythology and Arthurian legend. Born in Rome to English parents who were both painters, Waterhouse later moved to London, where he enrolled in the Royal Academy of Art. He soon began exhibiting at their annual summer exhibitions, focusing on the creation of large canvas works depicting scenes from the daily life and mythology of ancient Greece. 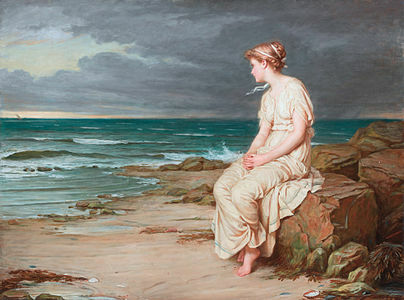 Waterhouse's work is currently displayed at several major British art galleries, and the Royal Academy of Art organised a major retrospective of his work in 2009. In 1854, the Waterhouses returned to England and moved to a newly built house in South Kensington, London, which was near to the newly founded Victoria and Albert Museum. 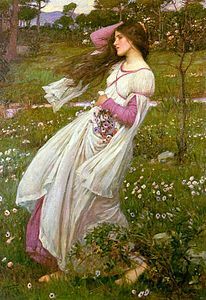 Waterhouse, or 'Nino' as he was nicknamed, coming from an artistic family, was encouraged to become involved in drawing, and often sketched artworks that he found in the British Museum and the National Gallery. In 1871 he entered the Royal Academy of Art school, initially to study sculpture, before moving on to painting. Waterhouse's early works were not Pre-Raphaelite in nature, but were of classical themes in the spirit of Alma-Tadema and Frederic Leighton. 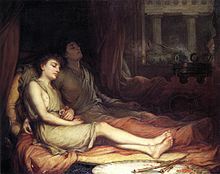 These early works were exhibited at the Dudley Gallery, and the Society of British Artists, and in 1874 his painting Sleep and his Half-brother Death was exhibited at the Royal Academy summer exhibition. 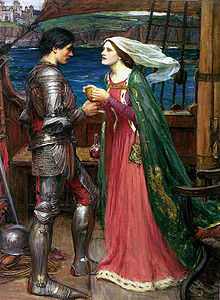 The painting was a success and Waterhouse would exhibit at the annual exhibition every year until 1916, with the exception of 1890 and 1915. He then went from strength to strength in the London art scene, his 1876 piece After the Dance being given the prime position in that year's summer exhibition. Perhaps due to his success, his paintings typically became larger and larger in size. In 1883 he married Esther Kenworthy, the daughter of an art schoolmaster from Ealing who had exhibited her own flower-paintings at the Royal Academy and elsewhere. In 1895 Waterhouse was elected to the status of full Academician. He taught at the St. John's Wood Art School, joined the St John's Wood Arts Club, and served on the Royal Academy Council. One of Waterhouse's best known subjects is The Lady of Shalott, a study of Elaine of Astolat as depicted in the 1832 poem by Alfred, Lord Tennyson, who dies of a mysterious curse after looking directly at the beautiful Lancelot. He actually painted three different versions of this character, in 1888, 1894, and 1916. Another of Waterhouse's favorite subjects was Ophelia; the most familiar of his paintings of Ophelia depicts her just before her death, putting flowers in her hair as she sits on a tree branch leaning over a lake. Like The Lady of Shalott and other Waterhouse paintings, it deals with a woman dying in or near water. He may also have been inspired by paintings of Ophelia by Dante Gabriel Rossetti and John Everett Millais. He submitted his 1888 Ophelia painting in order to receive his diploma from the Royal Academy. (He had originally wanted to submit a painting titled A Mermaid, but it was not completed in time.) After this, the painting was lost until the 20th century. It is now displayed in the collection of Lord Lloyd-Webber. Waterhouse would paint Ophelia again in 1894 and 1909 or 1910, and he planned another painting in the series, called Ophelia in the Churchyard. In January 2018, curators at Manchester Art Gallery removed Waterhouse's 1896 Hylas and the Nymphs from public display leaving an empty space to encourage debate as to how artistic depictions of women's bodies should be displayed. Post-it notes were provided for visitors to air their views, and postcards of the painting were removed from the gift shop. The gallery's actions prompted a backlash with accusations of censorship, puritanism, and political correctness. The painting was rehung after a week's absence. ^ Trippi 2002, p. 4. ^ Trippi 2002, p. 9. ^ Trippi 2002, p. 14. ^ "Victorian nymphs painting back on display after censorship row". BBC News. 2 February 2018. Retrieved 4 February 2018. Trippi, Peter (2002). J. W. Waterhouse. New York, New York: Phaidon Press. ISBN 9780714842325. Bénézit, E (2006). "Waterhouse, John William". Dictionary of Artists. 14. Paris: Gründ. pp. 668–669. Gunzburg, Darrelyn (2010). "John William Waterhouse, Beyond the Modern Pre-Raphaelite". The Art Book. 17 (2): 70–72. doi:10.1111/j.1467-8357.2010.01104.x. ISSN 1368-6267. Hobson, Anthony (1980). The Art and Life of J.W. Waterhouse, RA, 1849-1917. Rizzoli. ISBN 978-0-8478-0324-8.